Yaya Toure, the newly crowned 2015 BBC African Footballer Of The Year, has confirmed he is ending his international break and will return to the Ivory Coast team. The Manchester City midfielder captained the Elephants to Africa Cup Of Nations success in February, and then announced he was considering retiring from international football. After ten months away from the national side, the 32-year-old says he is ready to return to the Ivory Coast set-up. "I think I will be back with the national team. I will be back now, and I'm delighted," Toure told BBC Sport. Toure was a key influence in Equatorial Guinea earlier this year, as his country ended a 23-year wait for their second Nations Cup title, overcoming Ghana in a penalty shootout in the final. It was Toure's first trophy with the national team in his sixth Nations Cup tournament, having lost in two finals - in 2006 and 2012. After winning the Nations Cup, he said he consulted with his team-mates about his immediate international future. "I was talking to the guys and told them I was thinking of having a break because years ago, I played so many games and I felt it in my leg," Toure said. "I was playing games with the national team, in the Premier League as well, in the FA Cup, the World Cup, the Africa Cup of Nations - there were so many games. "So at the beginning of this season I decided to have a little bit of a break - just to maybe have a few days when we had an international game. "And for me, that was a great idea and the ideal moment to step a little bit outside, to breathe a little bit. Because playing too much football can affect your body and can also affect the people around you too," Toure added. 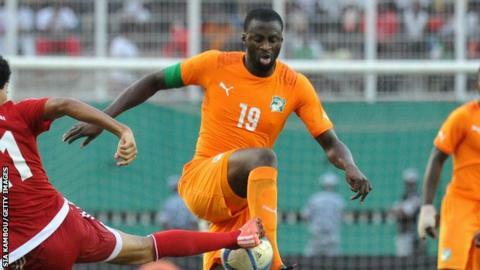 Toure's return will be a big boost for Ivory Coast ahead of their next competitive match, scheduled for March 2016, as they continue the defence of their Africa Cup of Nations crown. They will face Sudan in a Group I match, as they aim to qualify for Gabon 2017.